I have two, four-legged furry children. They are my little rescue miracles and the closest thing I have to my own children (of the human persuasion of course). I love them so much, and I would do anything for them. It’s possible that everything they have is gender neutral because I can’t stand the color pink, but I really didn’t think about it until just a few days ago…no this post isn’t all about my dogs (even though I could go on and on about them), and yes I understand the difference between human children and furry children. But it is a mini rant about the socialization of children, followed up by a solution to my rant. If you want to buy the little girls and boys in your life things that are outside the proverbial gender box, please continue reading. If you believe little boys should be raised to be emotionless, macho men, and little girls should be raised to be submissive, barefoot, pregnant, and at home, then this post is not for you. Christmas happens to be my favorite holiday. The lights, the cold, crisp weather, the warm and fuzzy feelings, and the time with family make me so very happy. I’ve lived all over the country and all over the world, and when I’m homesick, without fail, I watch Christmas movies to make me feel better…regardless of the time of year! I get to be home for Christmas this year, and this year, my adorable, little, nearly 3-year-old cousin will be there too (with her parents and adorable baby brother…I have to mention that I love them too of course). She is the most adorable little angel and so damn smart! I got to spend some quality time with my darling cousin over Thanksgiving, and I decided that I wanted to get her something special from me (as opposed to from my whole family) for Christmas. This is where my quest for a thoughtful gift began as well as the carving out of the soap box I’m about to step onto. I hate shopping, so I first hit the ads in the Sunday paper in hopes of getting an idea of what was out there these days. Let me tell you what’s out there…baby carriages, Barbies and other scantily clad dolls, bride dress-up sets, and a whole slew of other pink crap, not meant to challenge or educate young girls in any way…unless you count encouraging girls to aspire only to be good at keeping up the house and taking care of babies to be enough of a challenge that is. Here is where I apply an abridged version of my “TEHO” (To Each His/Her Own) speech–if a girl grows up to be a woman and decides that she aspires to be a wife and mother above anything else, then God bless her! There are not enough words in the English language or enough blogging space to express how much I appreciate women who commit their lives to the raising of their children (my own mother included and especially). However, to me, it is revolting that this kind of message is being disseminated on such a huge and regular basis. I looked through countless ads, both hard copies and online and did some general “gifts for girls” searches, and they all had the same stuff. Well that crap is not good enough for my cousin, and frankly, I don’t think it’s good enough for the amazing girls who will grow up to be amazing women. Spark Talking Telescope: Just what it sounds like…a talking telescope that is appropriate for children and comes with an assortment of slides. Seems to be great for bug-loving children! Discovery Kids Send Away Storybook Publisher: I wish they had these when I was a kid! This awesome little kit allows your child to write, illustrate, and publish their very own book. The kit includes everything needed to help plan, write, and illustrate the story and even has a pre-paid envelope included to send off their masterpiece! A few weeks later the publishing company sends back a hardbound, professionally typeset book. Electronic Gadget Lab: Who says that boys are the only ones who can aspire to be engineers??!! This kit includes a plastic “grid” that simulates a circuit board. Kids can snap in wires and batteries, rearrange light bulbs, speakers and other devices, and learn the ins and outs of how these things work…the description says that it comes with 101 configurations and appeals to third graders and teens alike. Gender-Neutral Coloring Books: I happen to love this concept. Why should most of the superheros be boys? And why should the girl superheros look like Barbie dolls? And why shouldn’t girls be taught that they can rescue themselves and don’t have to wait for the prince to climb up the tower…anyway, you get the picture. Ultimate Star Planetarium: For the stargazers…This mini planetarium projects constellations, celestial objects, and more. It provides an interactive computer and searchable database with facts versus myths of the wonderful world of outer space. Chess Set: Learning to play chess is on my bucket list. Maybe it’s just in my head, but it seems to me that boys learn to play chess, and girls learn to play with dolls. I didn’t do the doll things, so I’m not sure what I was doing when my brothers were learning to play chess…nevertheless, girls can learn to play chess too! Robyn Superhero Tutu Costume: I’m convinced that I have taught some of the most amazing kids on the planet. This costume reminds me of one girl in particular. She was in one of the first grade classes I taught, and one day, as part of a class project, the kids were allowed to choose exactly what they wanted to wear to school that day. This precious girl showed up in a red tutu, yellow rain boots, an old Beatles t-shirt, huge butterfly sunglasses, and a kids’ tool belt (filled with all the plastic tools) around her waste. Some kids want to be tutu-wearing superheros…and I fully support that! GoldieBlox: Their tagline is “Toys for Future Inventors.” I think that sums it up. 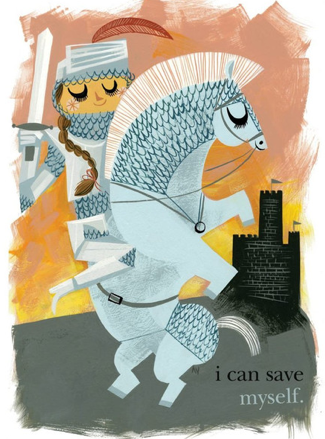 I Can Save Myself Poster: Just what it sounds like…a poster with a fabulous illustration that says, “i can save myself.” I love it…and just might order it for myself. 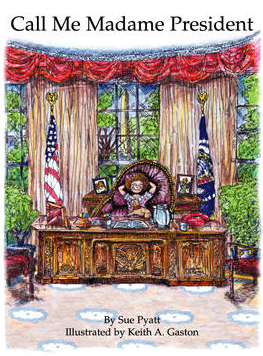 Call Madame President: This is a great story about an imaginative 8-year-old girl who becomes President of the United States…I don’t want to ruin it for you, but why shouldn’t little girls read about being President?? Arduino Cookbook: Not your average cookbook…this one gives you tips and tricks for building an array of things–toys, detectors, robots, and more. New Moon Magazine: A completely ad-free magazine that is geared towards the community, growth, and education of girls. It is a magazine that’s sole focus is building confidence and healthy online behavior…how many magazines did we all see growing up that had nothing but impossibly thin women teaching us to aspire to be trophy wives?? This magazine does things like name Malala Yousafzai as their girl of the year…love it! Women Who Dare (Vol. 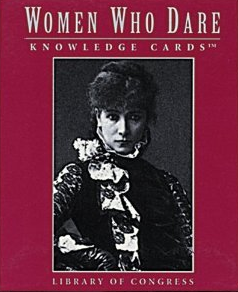 1 & 2) Knowledge Cards: These cards include information and tributes to women throughout history who have shown determination and courage to sift through what they were “supposed” to do and reach into the extraordinary–some changed their communities, and some changed the world. Roominate: This is another site that includes age-appropriate toys that encourage artistry, architecture, engineering, and visionaries in general. Hand Crafting Justice: This site includes a great variety of hand crafted goods, created by “enterprising women in the developing world, working to lift themselves and their families out of poverty.” These are great gifts with great purpose. And if you want even more ideas, check out the AAUW (American Association of University Women) 2013 Gift Guide and LiveYourDream.org! Great post! All those are great gift ideas, especially the chess set. I am absolutely terrible at it and I haven’t played in a long time, but it is tons of fun to play. The only thing is finding another person who can play; that can be a challenge at times. This isn’t exactly a gift idea but considering one of the themes of this post is getting young girls interested in STEM, I would suggest introducing them to coding. Learning to code can be quite fun, and introduces many important skills, like analytical thinking and problem solving. The programming world is dominated by men, and while inroads have been made, there is still plenty of room for improvement to get more women involved. Roughly 75% of middle school girls express interest in STEM fields, but by the time they are seniors in high school, less than 1% choose to major in Computer Science. Our education system is doing a terrible job of encouraging girls to pursue their interest in the sciences, so why not do something about it and encourage your child to learn how to code? http://code.org/learn is a great place to get started. There are numerous other places you can look up too; just do a Google search. Now, everything I just said is just as true for all of the other math and science fields, but I was a Computer Science major, so I am biased.